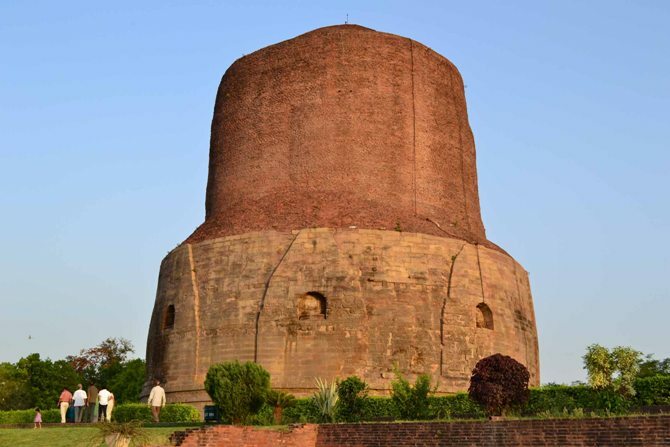 Dhamek Stupa (also spelled Dhamekh and Dhamekha) is a massive stupa located at Sarnath, 13 km away from Varanasi in the state of Uttar Pradesh, India. Stupas originated as pre-Buddhist tumuli, in which ascetics were buried in a seated position, called chaitya. After the parinirvana of the Buddha, his remains were cremated and the ashes divided and buried under eight mounds with two further mounds encasing the urn and the embers. Little is known about these early stupas, particularly since it has not been possible to identify the original ten monuments. However, some later stupas, such as at Sarnath and Sanchi, seem to be embellishments of earlier mounds. 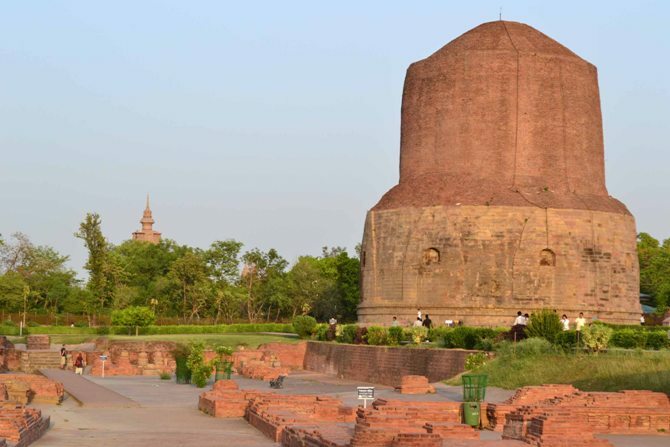 The Dhamek Stupa was built in 500 CE to replace an earlier structure commissioned by the great Mauryan king Ashoka in 249 BCE, along with several other monuments, to commemorate the Buddha's activities in this location. Stupas originated as circular mounds encircled by large stones. King Ashoka built stupas to enshrine small pieces of calcinated bone and other relics of the Buddha and his disciples. An Ashoka pillar with an edict engraved on it stands near the site. The Dhamek Stupa is said to mark the spot of a deer park (Rishipattana) where the Buddha gave the first sermon to his five disciples after attaining enlightenment, "revealing his Eightfold Path leading to nirvana". The stupa was enlarged on six occasions but the upper part is still unfinished. 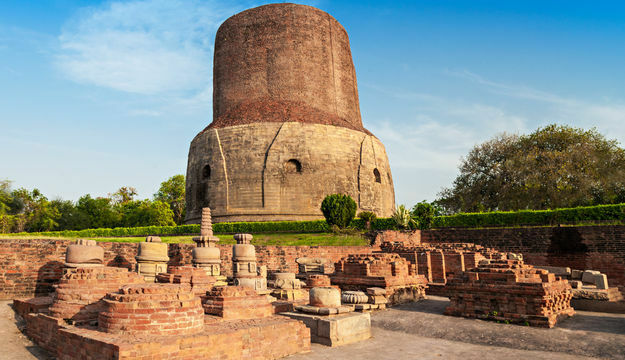 While visiting Sarnath in 640 CE, Xuanzang recorded that the colony had over 1,500 priests and the main stupa was nearly 300 feet (91 m) high. 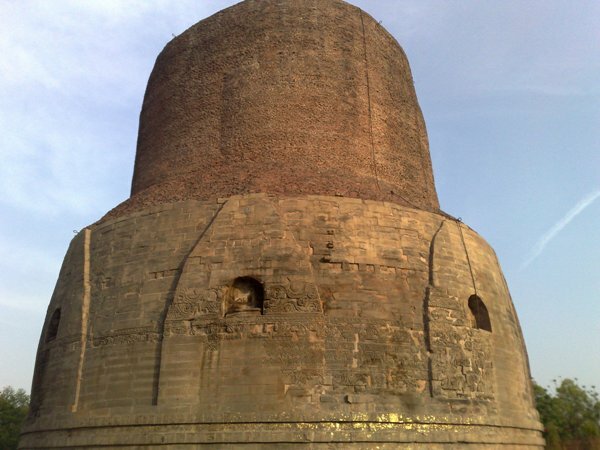 In its current shape, the stupa is a solid cylinder of bricks and stone reaching a height of 43.6 meters and having a diameter of 28 meters. 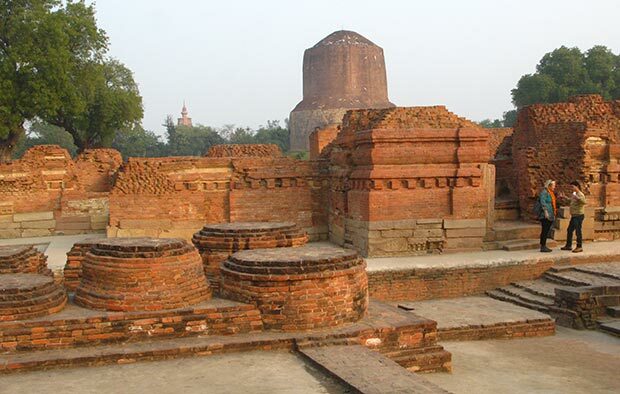 It is the most massive structure in Sarnath. The basement seems to have survived from Ashoka's structure: the stone facing is chiseled and displays delicate floral carvings of Gupta origin. The wall is covered with exquisitely carved figures of humans and birds, as well as inscriptions in the Brāhmī script. By Rail: The major junction in the northern state is Lucknow junction, which is connected by all the cities major or minor. Superfast trains, Shatabadi, Rajdhani all express trains run on this route. Apart from Luckow all the major cities of Uttar Pradesh has stations, and are well connected and easily approachable. By Road: The roads are not that well maintained, with poor road service at a few a routes. There are state bus services which is not very good in condition. But private bus service and cabs run. Every city is well connected to each other. One can drive down to cities in its private vehicles. 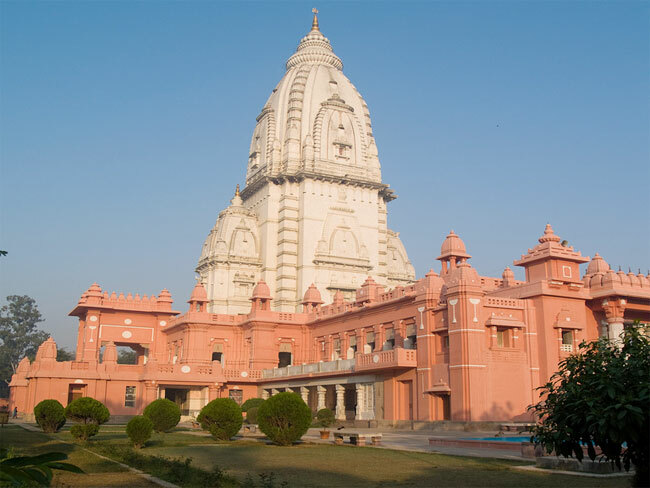 Roads and road traffic is not under control, but the food and accommodations at all cities are well maintained with good service.Find detailed information about how to reach Uttar Pradesh by Train, Bus, air, flight timing and schedule. Read reviews, details to know how to reach Uttar Pradesh & get information about Uttar Pradesh.